Spring fever is in the air! Here at Health, that means it's time to buy some seasonal spring produce. We have the perfect meal for lunch or dinner, which incorporates two of our favorite spring foods: asparagus and artichoke. Spring fever is in the air! Here at Health, that means it's time to buy some seasonal spring produce. We have the perfect meal for lunch or dinner, which incorporates two of our favorite spring foods: asparagus and artichoke. This salad is stacked with nutritional benefits, including fiber (in both the artichokes and asparagus), antioxidants, and vitamins A, C, E and K (in the asparagus). At only 184 calories and with 15 minutes of prep and cook time, this lean, green salad is one worth trying. To start: rub the inside of a large salad bowl with the cut sides of a garlic clove; discard garlic. Add oil, lemon juice, oregano, salt, and pepper to the bowl; whisk well. Add artichokes, tossing gently; let stand at room temperature. Meanwhile, place edamame in a large pot of boiling salted water; cook 2 minutes. 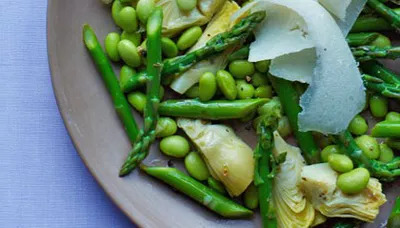 Add asparagus; cook until asparagus and edamame are crisp-tender (about 3 minutes). Rinse under cold water, drain well, and blot dry with paper towels. Add asparagus and edamame to artichoke mixture; toss. Transfer to 4 individual plates. Arrange shaved Parmesan over each salad. Serve. Ingredients: garlic clove, extra-virgin olive oil, lemon juice, dried oregano, salt, pepper, canned artichoke hearts, shelled edamame, medium asparagus, Parmesan cheese.